FRANCE: President Emmanuel Macron has renegotiated tariffs for six offshore wind farms awarded in 2012 and 2014, the French energy minister has confirmed. France recently commissioned its first offshore wind turbine - a 2MW Vestas unit mounted on Ideol's Floatgen floating platform. Nicolas Hulot tweeted the tariffs had been reduced from about €200/MWh to about €150/MWh. The projects include Iberdrola and Eole RES’ 496MW St-Brieuc, and the 450MW Courseulles-sur-Mer, 480MW St-Nazaire, and 498MW Fécamp, awarded to a consortium led by EDF Energies Nouvelles in the first French tender round in 2012. They also include the consortium led by Engie’s Dieppe-Le Tréport and Les Iles d’Yeu Noirmoutier, both of which were awarded in the second tender in 2014 and both of which are 496MW. Since the projects were awarded, prices elsewhere in Europe tumbled, prompting the government to seek cheaper tariffs. The French wind energy association (FEE) added that the tariff cuts had saved a total of €15 billion. 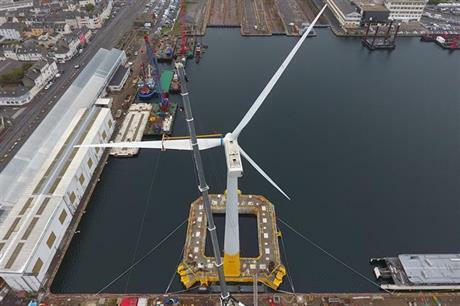 France recently installed its first offshore wind turbine — a 2MW Vestas unit mounted on Ideol's Floatgen floating platform.